Esri has published a pair of interactive maps about the 7.8 magnitude earthquake and aftershocks that struck Nepal over the weekend. The following maps are available for the media to embed or share as part of ongoing coverage. Explore the locations and intensities of the various quakes that struck Nepal, along with a shakemap from the USGS. This map also includes geotagged social media from Twitter and YouTube with local content related to the quakes. Take a closer look at Nepal’s history of seismic activity and learn more about the people impacted by the earthquakes. This story map also includes information about relief operations and key points of interest in the region, as well as a 3D web scene of the area affected by the avalanche on Mt. Everest. 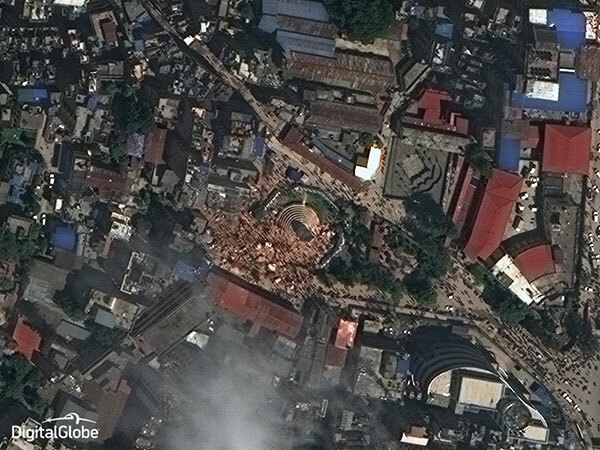 In response to the devastating 7.8-magnitude earthquake that struck central Nepal on April 25, DigitalGlobe has made high-resolution satellite imagery of the affected areas freely available online to all groups involved in the response and recovery effort through the company’s FirstLook initiative. This imagery can be accessed via http://services.digitalglobe.com. Airbus Defence and Space has acquired Pléiades satellites imagery to support the International Charter and Copernicus Emergency Management Service. The data acquired will assist in assessing the damage and help rescue organisations in the delivery of humanitarian aid. 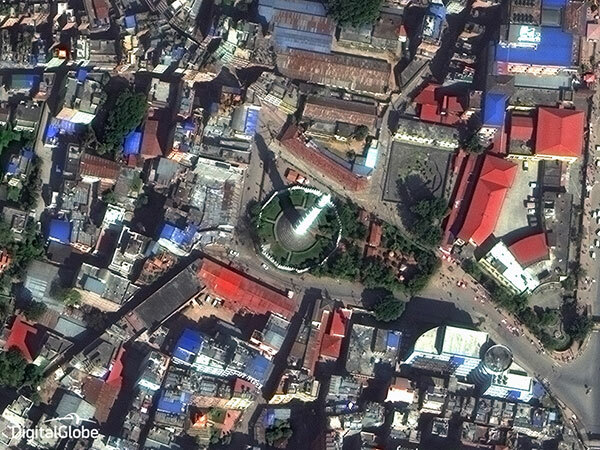 The before and after Pléiades images over Kathmandu show the devastation caused by the earthquake. The “before” Pléiades image was acquired on November 29, 2014, and the “after” Pléiades image was acquired on April 27, 2015, two days after the earthquake. This entry was posted on Tuesday, April 28th, 2015 at 9:39 am. You can follow any responses to this entry through the RSS 2.0 feed. You can leave a response, or trackback from your own site.